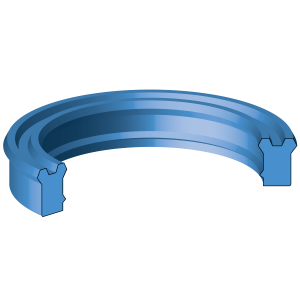 Rod seals for hydraulic cylinders seal the system pressure on the rod side of the cylinder against the atmosphere. They seal the pressures during the stroke phase and position holding operation of the cylinder. The individual profile design show specific behaviours and performance which need to be in line with the application´s requirements. There are single or tandem designs of rod sealing systems. The rod sealing system considers also the wiper and the guiding elements. Basic Materials: All known types of rubber, polyurethane, PTFE, fabric reinforced elastomers and plastic materials.